Donate on Giving Tuesday to ensure that the fight for true lived equality will continue UNTIL WE’RE ALL EQUAL! Feeling excited and empowered after more than 200 LGBTQ stakeholders and allies came together on Monday night for a Post-Election Action Forum to discuss how to react to the Trump-Pence administration, we are determined to be vigilant in fighting for our rights over the next four years, and we are asking everyone to step up to help. 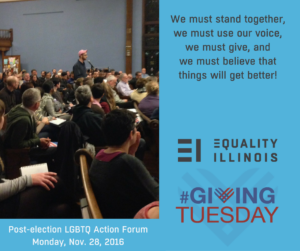 On Giving Tuesday, please help Equality Illinois with at least a $25 donation.